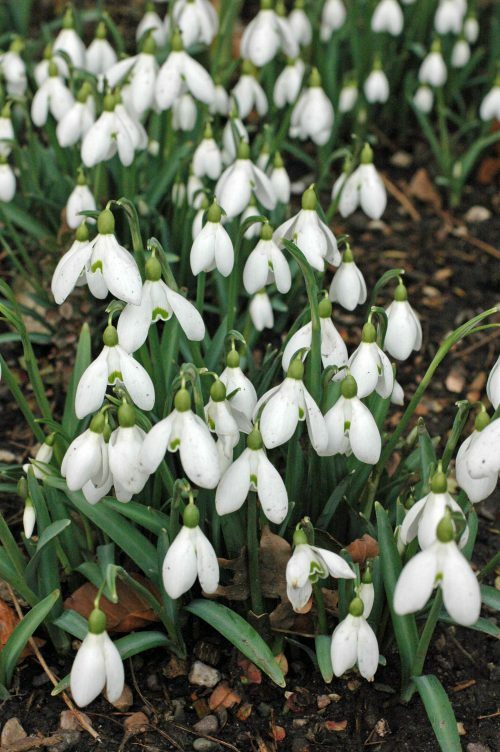 Snowdrops are iconic flowers that traditionally herald the ending of winter and are the first bulbs to bloom and to show signs of life after the winter months. 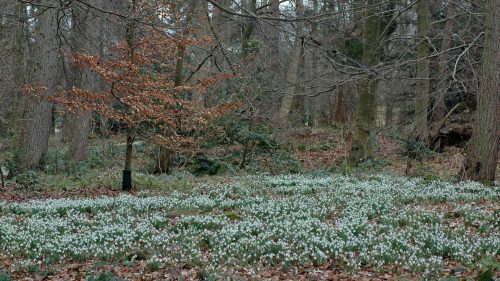 In Britain, Snowdrops are possibly both native and naturalised and were not recorded as growing wild here until the 1770s. 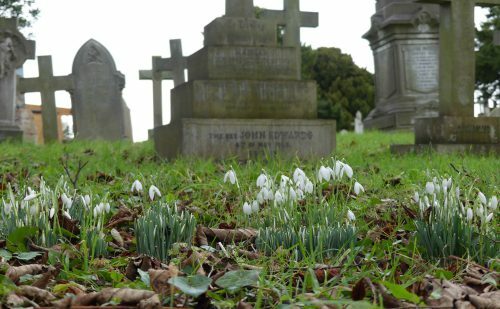 It is likely that many of our colonies of wild Snowdrops originated with ecclesiastical plantings. 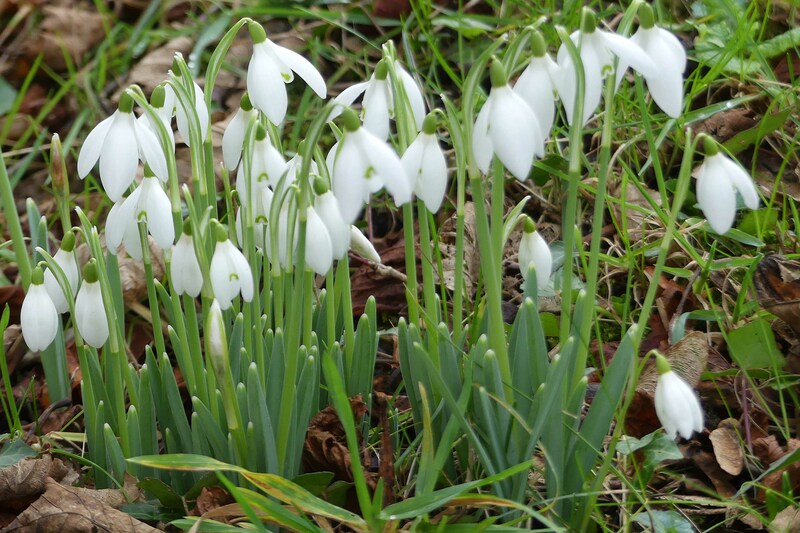 The pure white blooms of the Snowdrop have long been accepted by the Catholic Church as a symbol of Candlemas, celebrated on February 2nd, the Feast of the Purification of the Virgin Mary, and their association with monastic sites is apparent right across Britain. Description: Height 15-25cm (6-10″). Strap-shaped bluish-green leaves grow at the base of each stem, which bears a single drooping blossom. The flower has three spreading sepals that grow longer than the its green-tipped petals. 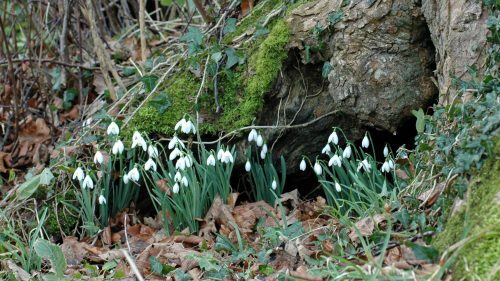 Habitat: On the European continent Snowdrops grow in wild habitats, in damp woods and meadows up to 1,600 metres. One of the local names for the snowdrop is the ‘snow piercer’ and this describes exactly how the flower pushes its head up through the snow or winter-hardened earth to brighten otherwise gloomy February woodlands. A small leaf-like spathe, or protective sheath, covers the tip of the flowering stem and enables the snowdrop flower to force its way up through the snow. 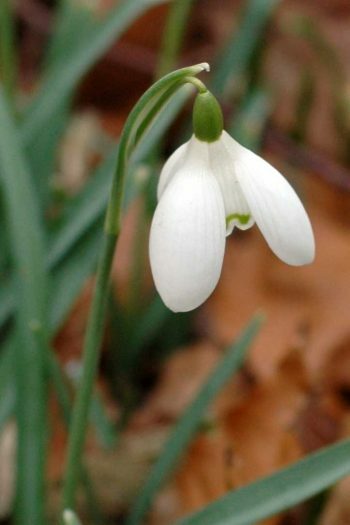 The snowdrop provides an early source of nectar for bees, which in turn pollinate the flowers. 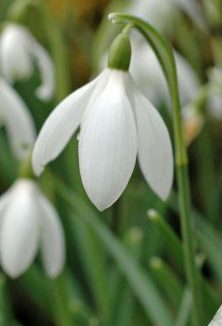 Nectar is secreted by the green-spotted inner petals of the snowdrop and as the bee forages, it brushes onto the female stigma some of the pollen that has stuck to its body whilst visiting other flowers. Lovely post full of fascinating info. 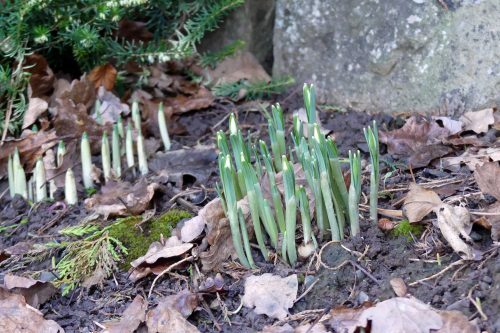 It always makes me happy to see the first snowdrops. Thank you Emily, I love them too and am always amazed that such dainty looking blossoms are in reality, so tough!